After rocking the market with GPRS / EDGE based Mobile Internet packages, Zong is back with an outstanding package for all its mobile internet users; ZONG Daily Unlimited Mobile Internet Package. Now for just Rs. 10 / day you can surf and download as much as you want all day long. This package is available to all Prepaid Zong customers on all commercial packages. Zong understand your download needs and it's time to step out of the bits and bytes charging domains to experience the joy and liberty of unlimited downloading. And that's pretty logical too, why should you pay extra when ZONG is offering you something which you've been looking for. To Activate just dial *909# from your ZONG connection and get connected. This package is available to all Prepaid Zong customers on all commercial packages. 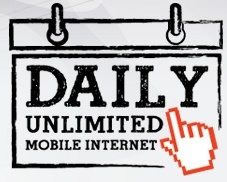 * Fair usage policy of 50 MB limit per day applies. After the consumption of 50MB the subscriber would be charged as per the default package. I think it is just a reaction of Jazz 50 Mb package.